Discuss with your students the ramifications of the "fault, but no failure" philosophy with regard to their daily jobs. How do their actions impact the reliability of systems, and what can they do to minimize the chances of system failures? "MTBF" = Mean Time Between Failures, a statistical figure based on the failure rate of a large batch of continuously operating units. While the Üseful life" and "Wear-out" phases of the system life-cycle are easy to understand, the initial Ïnfant mortality" phase is not so intuitive. Explain what factors might lead to premature component failure during this initial phase of a system's lifespan. A division of the United States Department of Defense (DoD) as the Reliability Analysis Center, or RAC, publishes detailed analyses of failure modes for a wide variety of components, electronic as well as non-electronic. They may be contacted at 201 Mill Street, Rome, New York, 13440-6916. Data for this question was gleaned from the RAC's 1997 publication, Failure Mode / Mechanism Distributions (FMD-97). The Orbiting Astronomical Observatory was a NASA project during the late 1960's and 1970's to place precision observational instruments in earth orbit for scientific purposes. Satellites designed for this program had to have "hardened" circuitry to withstand the radiation, extreme temperatures, and other harsh conditions of space. 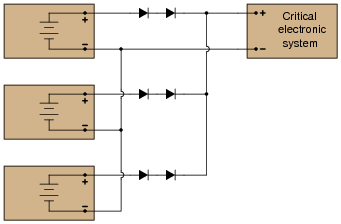 First, draw a schematic for a non-redundant, passive AND gate. Which components shown in the above schematic are "redundant," and which are essential? Then, explain why the circuit is referred to as quad-redundant. How many individual component failures, minimum, must occur before the gate's functionality is compromised? 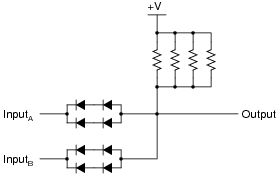 Prove your answer through an analysis of the circuit's operation. Follow-up question: why do you suppose transistors were eliminated from this gate circuit's design? While this may seem like överkill," to use redundant diodes on redundant power supplies, it is a design feature that does not cost very much. Given the measurable improvement in reliability with minimal increase in cost, this design feature is not unreasonable. 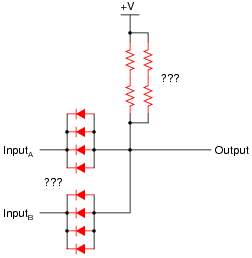 Explain why the circuit is referred to as quad-redundant. How many individual component failures, minimum, must occur before the gate's functionality is compromised? 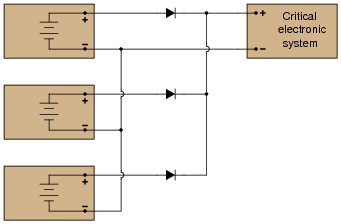 Prove your answer through an analysis of the circuit's operation. 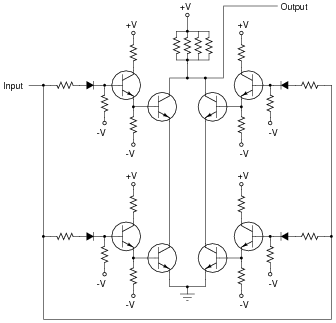 This circuit is a good one to discuss with your students in class. Ask them to explain its basic operation: if all components are functioning properly, what happens when it receives a "high" input, versus a "low" input? Do the input signals need to be current-sourcing or current-sinking? 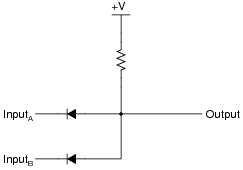 What about the output of this circuit: does it source or sink current?